I can’t believe that I’ve been in Melbourne for almost six weeks collectively and I’ve not done a cafe feature yet- believe me it’s not for lack of coffee drinking. Melbourne is an Australian city that’s famed for its coffee: supposedly there’s not a bad cup of coffee to be had here and so far I have to agree with that. As someone who has a severe caffeine addiction, I feel right at home in Melbourne and the irony is that I’ll look for food in the reduced section of the supermarket but will always splash out for a coffee or two. Since arriving in Melbourne, having got myself a job and being busy with christmas and New Year, indulgent coffee dates with myself and lazy mornings have been a rarity. However today I had the day off work and made it my mission to wake up early and accomplish everything I wanted to- and that primarily included going somewhere nice for morning coffee. Today I went to Journal Cafe which is located right in the heart of the hustle and bustle of the city in one of my favourite roads, Flinders Lane. I though this cafe would be a good one to do a bit of a feature on as it’s about as Melbournian a cafe as you can get. Journal canteen is not quite a cafe, not quite a restaurant, a description that is apt for a lot of Melbourne’s coffee shops. However unlike a lot of the eating and drinking establishments in the city centre, Journal has lots of room to sit in. It’s open plan decor means that it’s spacious, bright and best of all it’s not imposing if you’re just wanting to have a coffee by yourself. 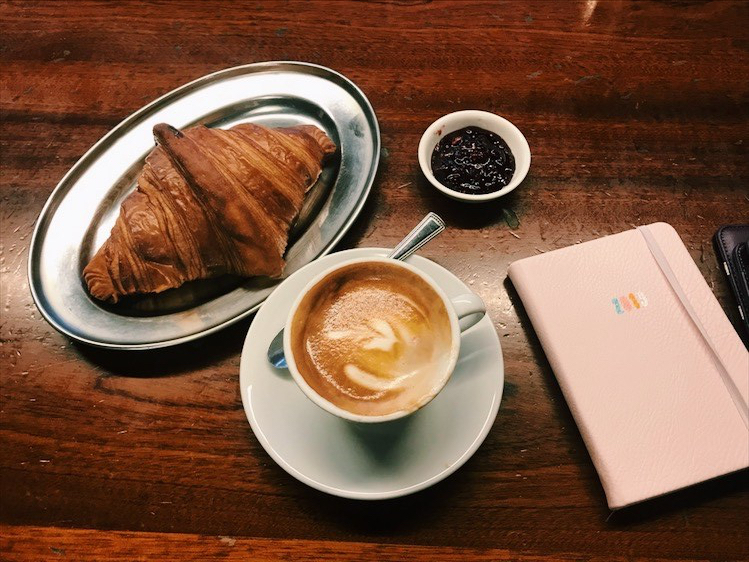 Whether you’re just after a quick coffee, a cooked breakfast or a sit down meal, Journal’s simple but accommodating menu has something to offer for everyone. The cafe offers all of the usual options for breakfast and then a small selection of pasta dishes and roasts for lunch and dinner. The staff were really welcoming and the service was so efficient. Prices in the cafe are average for Melbourne, around $16 for mains and $5 for a coffee. I didn’t have anything that fancy this morning apart from a coffee and a croissant: obligatory despite having just had breakfast. The coffee was excellent and the croissant was warm and flaky. They have a handful of newspapers on the counter ready to read. All in all it’s a nice place to start the day off in the city.